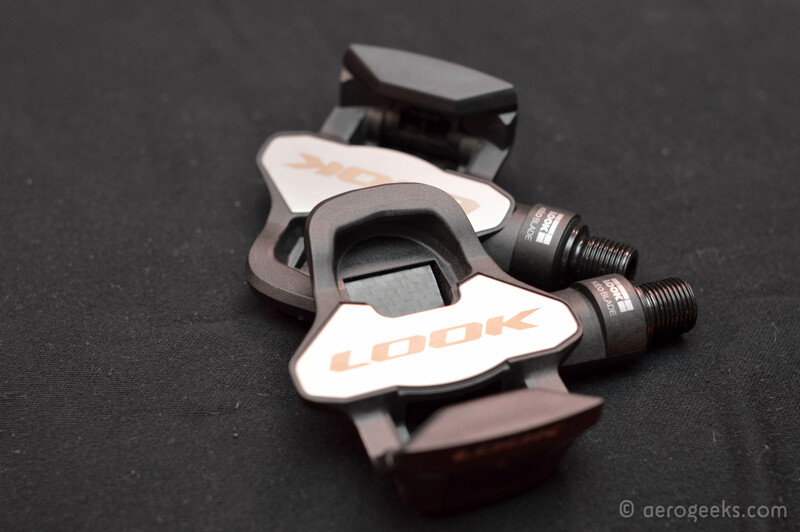 We have been wanting to experience Look’s Kéo Blade Aero pedals ever since we saw them a few years ago. Between the claimed aero savings, the precise engagement of their carbon blade, and the simple allure of Look’s top-of-the-line (non-power) designation, we knew these were worth checking out. However, at Interbike this year we got a chance to check out the successor to the Aero—the Kéo Blade 2—and ended up flying home with a brand new pair in our carryon luggage (which didn’t cause as many strange looks from TSA as we thought it would). The Kéo Blade 2 takes the concepts of the original Kéo Blade Aero and kicks them up a notch. 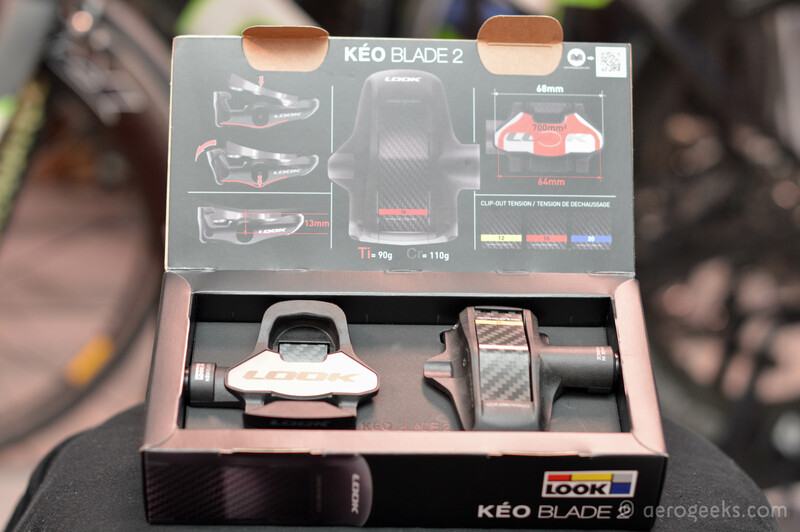 The Kéo Blade 2 is based on Look’s Blade technology. 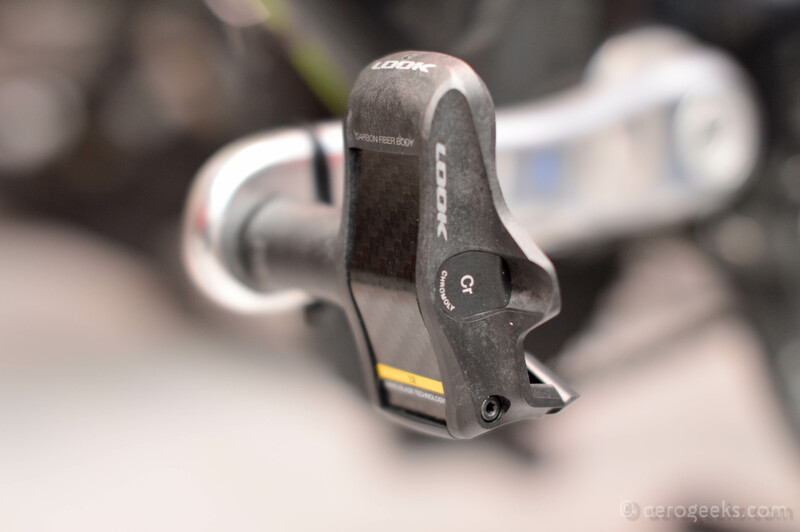 Where most pedals’ retention systems are based on a metal spring, the Kéo’s use a linear rate carbon blade spring. The spring is available in tensions of 12, 16, and 20 nm. Look believes that most cyclists will be fine with the 12 nm version, while the 16 and 20 are reserved for those cyclists looking for the maximum retention they can get. In fact, Look actually warns riders to not use a 16 or 20 pedal unless your actual experience with the 12 blade pedal confirms that you need a firmer binding, and that you feel totally confident with higher release torque. With the Blade 2, Look has moved and widened the carbon spring versus the original Blade. You can easily see in the image below how much smaller the carbon spring was on the original Blade Aero than on the new Blade 2. Look then took that widened spring and integrated it into the carbon body of the pedal to create a more aerodynamic profile. Look previously offered the standard Kéo Blade and the Kéo Blade Aero, which had an aerodynamic shell. With the new design, Look is able to offer a single Blade option that optimizes aerodynamics. Look has also designed channels on either side of the spring to control the air flow. With the Blade 2 you are also getting the largest support surface that Look offers. The Blade 2’s surface measures 64mm wide with 700mm2 of total area. For comparison sake, the Kéo 2 Max Blade offers a support surface that is just 57mm wide with a total surface of 340mm2. The axle on the Kéo Blade 2 features an oversized axle that allowed Look to reduce the stack height (just 13mm). It is composed of two miniature ball bearings: one 12mm inner x 18mm outer diameters, one 6mm inner x 12mm outer diameters and a needle roller bearing. LOOK spindles are only approved after a rotational test of 2 million cycles at 100 rpm with a load of 90kg on the center of the pedal and an eccentric rotation (replicating a bump each revolution – hopefully a bit more wear and tear than you are planning for). The Kéo Blade 2 is offered in two axel materials – Titanium (Ti) or Chromoly (Cr). The Chromoly version weighs in at a measured 110g per pedal, while the Titanium version weighs a claimed 90g. The Cr version retails for $299, while the Ti can be had for $399. Before we jump into our long term thoughts, let’s give a little background. 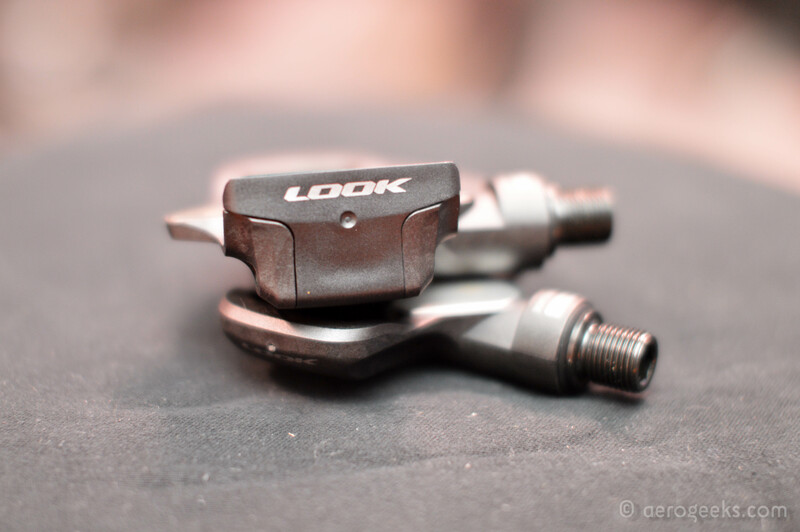 Mike, who did the majority of this review, is very familiar with Look’s line of pedals. Starting with the Kéo Classic to his current Kéo 2 Max, he has spent many a mile clipped into a pair of Looks. So from the first moment he clipped into a pair of Cr Blade 2s, he was comparing them against their own brethren. One of the questions we had was whether he would notice a significant difference. Let’s just say that the fact that he has threatened the rest of the team with immense harm if they try to claim his Blade 2s probably answers that question. Getting back on track… We came home from Interbike with a set of Cr Kéo Blade 2s with the 12 nm blade. The first thing we noticed once we got them onto a test bike was the engagement. It feels much more precise than any other Look pedal we’ve used. Look pedals that use a metal spring tend to have some wiggle room before you disengage (even with the tension maxed out). With the Blade 2s, the engagement and disengagement is precise and succinct – you are either in or out, there is no in-between. We were still using the gray Look cleats which provide 4.5°s of float, yet the float felt stiffer with the Blade 2s—there’s not much wiggle room. 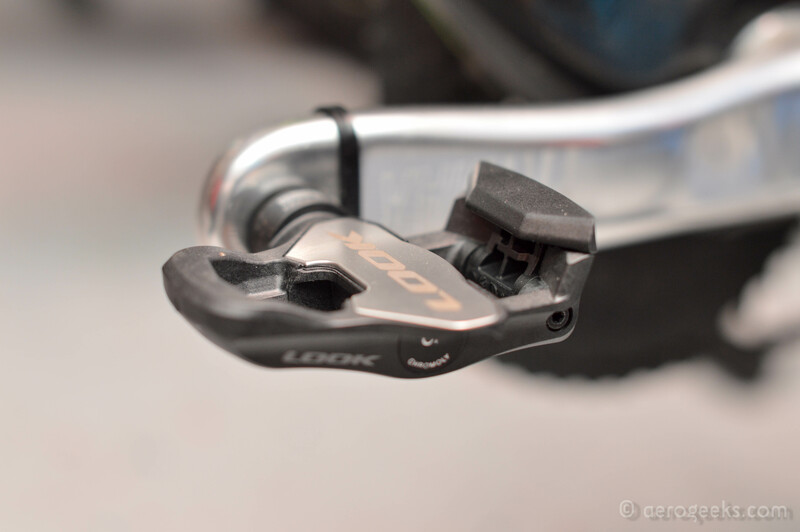 For those unfamiliar, the Look pedal system offers three float settings, each requiring a different cleat. The Black cleat offers 0° of float, the gray 4.5°, and the red 9°. Next thing you notice is that these pedals are not weighted. 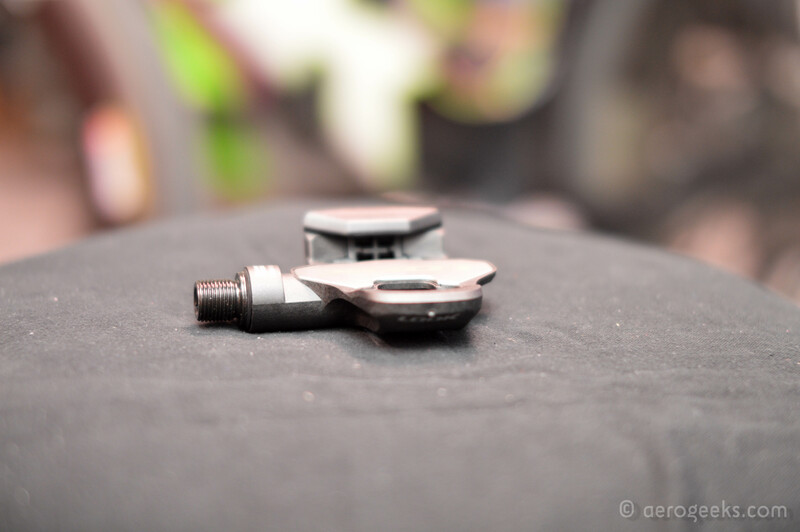 With other Look pedals, and pedals of many other brands, the back of the pedal is weighted so that the front of the pedal is pointed towards the sky when no cleat is clipped in. This makes engagement much easier since you can quickly get the cleat into the lip of the pedal. Look built the Kéo Blade 2 to be a race-first pedal, and part of that design philosophy is that you’re already clipped in for a race (either from a rolling mass start or your shoes are clipped in at transition). Because of this, there was no reason to waste weight to just make entry easier. At first, we thought we would dislike this since 99% of our miles are spent training—not racing. That means we have to contend with things like red lights, stop signs, and traffic. However, we quickly found this to be a nonissue on training rides and a definite advantage in races. Even if we didn’t have our shoes clipped in at transition, we could pre-position the pedals in transition and be confident that they would still be like that when we grabbed our bike. Lastly, we came to the question of whether we noticed the enlarged support area. That’s actually a bit tricky to answer. Going from the Kéo 2 Max to the Kéo Blade 2, we more than doubled the support surface area. Mike will tell you that he absolutely felt the difference in the pedal, reporting that the Blade 2s provided a completely different experience. There was a feeling of increased stability as well as the feeling that the entire width of the foot was centered over the pedal. However, some of this could be attributable to the change from a composite body to a carbon body, as well as a new spindle. And of course, in all honesty, some of this could just be more mental as well. Regardless, Mike now swears by the Blade 2s and used them for more than one race last season. We felt that in itself is something hard to ignore. We hate giving products we love back to companies; but alas, that is the life of a review editor. Once the review is over the products need to go back. But there are always some products that we end up begging the company to keep—even if that means we end up paying out of our own pocket for them. With their increased stability, precise engagement, and aerodynamic design the Look Kéo Blade 2s definitely fall into that category. And in the end, that’s about as big a vote of confidence from the Aerogeeks as you can get.